Is it the death knell for the book? - And here the word book infers the physical book printed on paper. Amazon began selling Kindle e-books in November 2007. In July 2010, the number of Kindle e-books sold surpassed the number of hardcover books. In December, 2010 Kindle e-books outsold paperback books. In May 2011, Amazon announces that its customers are purchasing more Kindle e-books than all print books - hardcover and paperback - combined. This is less than four years after the introduction of the Kindle. On the other hand, is this news all that surprising? I certainly have noticed that my own reading habits have changed dramatically in the past five years. I would say that it has become rarer and rarer that I buy a book or a magazine. I am always reading on my computer. Granted, there are times like when I'm on vacation that I like to buy a few magazines because they're easier to read on the plane. Sitting pool side or on a beach just feels right with a paperback book. Other than that though, it's strictly computer. I don't think I buy newspapers anymore. Everything I read is via the Internet and Google news has turned into my mainstay of up to date information from around the world. Considering the writing I've been doing, it is far easier to research on the Net then copy and paste stuff to complete an article. Not so easy with a newspaper, I mean a physical newspaper. Besides, on the Net I can read about an item from different papers and get a different perspective. I have been studying some French off and on over the years. About 4 years ago, I purchased electronic copies of the dictionaries I use. Since then, I have not cracked any of my dictionaries; all my studying is done at the computer. Electronic means doing fast look-ups, copy and paste of information, and the cross-referencing of words with merely a mouse click. I had no idea how much time I had been wasting by the physical process of thumbing through the pages of a dictionary. Now, I type in the word I want and hit Enter. Bingo, I've got my answer. I visit the Kindle E-book store and I find 731,875 for the total number of titles found. As I scan down the sidebar, I see 24 categories such as Fiction with 235,253 titles, Nonfiction with 498,085, Romance with 44,345 and Science with 57,212. Heck, that's a lot of books! Like a lot of people, I'm sure that anybody is going to hesitate, unsure of this newfangled thing. However, I mulled it over and decided hesitating was a little stupid. I buy a magazine, read it once, then either throw it away - Okay, I put it in recycling. I'm trying to be green. - or pass it on. That magazine could cost anywhere from five dollars to ten dollars. I slap down my money and don't think about. It's the same for a paperback novel. Why not do the same thing for an e-book? I just checked. I can buy an electronic monthly subscription to Time Magazine for $2.99. That's four issues. I know the mag costs - what? - seven or eight bucks for a single copy? The New York Times, a monthly subscription, can be had for $27.99. That's one month of daily papers. E-books range from $0.99 to $2.99 to four, five, or six bucks. There are more expensive e-books, but likewise, Amazon has titles for free. Just imagine. I would fork over seven or eight bucks to buy a copy of Time Magazine to read just once. I could have the same magazine in an electronic format for less than one dollar. Hey, who can argue with that? - Caveat! I read on Amazon: The Kindle Edition of Time contains most articles found in the print edition, but will not include all images. Okay, this is a reminder that the e-book, e-magazine, or e-edition of anything may not be 100% like the original. The Kindle device was created and is marketed by Amazon. Other publishers or book companies have come out with their own devices. Barnes & Noble offers the Nook. Chapters/Indigo in Canada uses the Kobo. Which one is better? Hard to say; my own experience is limited. However the one commonality which is an attractive feature is electronic paper. What the heck is this? Surprising enough, it's just that, it's sort of paper but - and here's the confusing part - it's electronic. We normally think of a computer screen. This device presents us stuff by emitting light. Paper on the other hand offers no light. We shine light on paper and it's the light or lack of light which we see. Electronic paper is similar. Instead of pixels turned off and on, physical bits are modified like individual pixels however these physical "bits" are just that, physical. In other words, the bit doesn't emit light, it reflects light and consequently is dependent on light being shone on it to show us something. What this means is that e-paper uses electricity to physically re-arrange the bits - like pixels - but once that is done, no more electricity is required. Now think about this. If you take 10 minutes to read a page on your computer screen, you use 10 minutes of electricity as the screen has to glow during that time. With e-paper, you use electricity to set the page but during the 10 minutes you need to read the page, no more electricity is necessary. Unlike a computer screen which becomes difficult to read in the sunlight, e-paper is reflecting light just like a piece of paper so you can read e-paper in the sunlight. I do not own a Kindle. What I did was to download and install the Kindle software for the PC. I purchase an e-book on the Amazon site and it is automatically downloaded to my local hard drive and installed into the software. I discovered the installation folder is buried in the Users directory of Windows 7 and I must take the time to back up my e-books. I paid for them; I don't want to lose them! Will I buy a Kindle? So far, my circumstances are such that I always have my laptop. I suppose that if this was not doable, investing in a Kindle would be a good idea. I've seen them and other e-readers and the concept seems good. Of course, not quite the traditional experience of holding onto paper and turning the pages, but who knows? Someday, there may be a generation which does even know books per se. E-books or e-publishing could be a boon for budding authors. Rather than go the traditional route which may be fraught with rejection notices, an author can do most of the setup work themselves and merely use companies like Amazon to sell the electronic product on their web sites. Fame and fortune may not be so far away. Okay, I'm joking. You still have to market it and get people to buy it. But there's hope. See my blog Writing: Amanda Hocking: indie author goes viral for a rather unbelievable story. This 26 year old woman wrote nine books in her spare time. In April 2010, she decided to try e-publishing them. From that point, she has said she never sold less than one thousand books a month and by the end of the year 2010, had sold a total of 185,000 e-books. According to reports, in January 2011 alone, she sold 450,000 copies of her titles through various electronic means including Amazon's Kindle. I do a rough calculation with the low number of 99 cents per copy with her keeping 30% and arrive at $133,650 in one month!!! As a word of warning to those trying to get published, read over my blog Writing: authonomy.com for some notes about an electronic but more traditional method of publication. I would also recommend you read Dean Wesley Smith: Dean of Star Trek. Somebody pointed out to me that the New York Times list of Best Sellers now has the sections hardcover, paperback, and e-books. Is this a sign of the times? My own habits are telling me that electronic publications are here to stay. There is no need to be wasting paper for a lot of material which is time sensitive like newspapers and magazines - you read it once - and reading it electronically over the Net makes a great deal of sense. Amazon's own sales numbers seem to indicate that the way of the future is here now. Amazon began selling hardcover and paperback books in July 1995. Twelve years later in November 2007, Amazon introduced the revolutionary Kindle and began selling Kindle books. By July 2010, Kindle book sales had surpassed hardcover book sales, and six months later, Kindle books overtook paperback books to become the most popular format on Amazon.com. Today, less than four years after introducing Kindle books, Amazon.com customers are now purchasing more Kindle books than all print books - hardcover and paperback - combined. An electronic book (also e-book, ebook, digital book) is a book-length publication in digital form, consisting of text, images, or both, and produced on, published through, and readable on computers or other electronic devices. Sometimes the equivalent of a conventional printed book, e-books can also be born digital. The Oxford Dictionary of English defines the e-book as "an electronic version of a printed book," but e-books can and do exist without any printed equivalent. 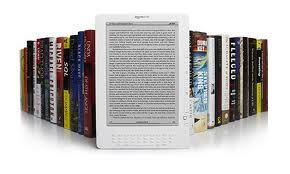 E-books are usually read on dedicated hardware devices known as e-Readers or e-book devices. Personal computers and some cell phones can also be used to read e-books. Electronic paper, e-paper and electronic ink are a range of display technologies which are designed to mimic the appearance of ordinary ink on paper. Unlike conventional backlit flat panel displays, electronic paper displays reflect light like ordinary paper. Many of the technologies can hold text and images indefinitely without using electricity, while allowing images to be changed later. Flexible electronic paper uses plastic substrates and plastic electronics for the display backplane. An e-book reader, also called an e-book device or e-reader, is a portable electronic device that is designed primarily for the purpose of reading digital books and periodicals.